It’s been four days since the Sanchi Iranian oil tanker sank in the East China Sea, and officials are carefully monitoring the ensuing spill, which has now spread into four distinct slicks. The toxic spill now encompasses an area 40 square miles in size, threatening local marine wildlife and the coasts of Japan and South Korea. China’s State Oceanic Administration says the four slicks are now strewn across 39 square miles (87 km). Manhattan, by comparison, measures 34 square miles (87 square km) in size. The slicks are spreading in both an easterly and northwesterly direction from the site of the wreck, the furthest extent reaching some 18 miles (30 km) away. The largest slick was measured at 2,625 feet (800 meters) in width. And that could be the least of it. This oil slick comes from the Sanchi’s 1,000 tons of diesel fuel, and not the 136,000 tons of Iranian ultra-light crude condensate contained within its hull. The fate of the condensate—which is colourless and odourless—is still not known, but if it leaked (or is currently leaking) from the sunken vessel, it would represent the largest tanker spill since 1991 when 260,000 tons poured the off ABT Summer near the Angolan coast. The giant oil tanker burned for over a week after it collided with a Hong Kong-registered freighter in the East China Sea, about 160 miles (260 km) from Shanghai. All 32 crewmembers aboard the Sanchi were killed, and only three bodies have been recovered. It finally sank on January 14, eight days after the collision. China is also planning to send a remotely operated sub to investigate the wreck, which is lying at a depth of 50 feet (115 meters). All 136,000 tons of the condensate—approximately one million barrels worth—could still reside in the tanker, or it could be leaking out, forming a toxic underwater “plume.” This form of crude is more soluble than conventional crude, so it has a more immediate impact below the surface. There’s fear that leakage from the wreckage could contaminate the ocean floor, affecting the surrounding environment for decades. The ship sank in an ecologically sensitive area, one that’s already prone to overfishing and pollution; water samples taken from 19 different sites showed excessive traces of petroleum at five of the locations sampled. 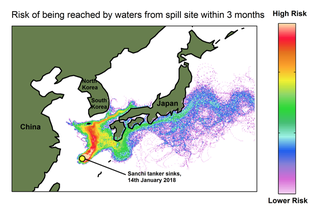 Updated computer simulations by the National Oceanography Centre suggests the Sanchi spill could reach Japan within a month, and is likely to affect Jeju island, a province of South Korea. The spill has also given rise to concerns over seafood contamination.